Orlando Vacation Rentals in Kissimmee is a holiday home with 1 room. Offering an outdoor pool, these Kissimmee holiday homes include a fully equipped kitchen and free WiFi access. Select homes offer a private pool. The Walt Disney World Resort is within 15 minutes' drive away. Guests can relax in the screened patio or separate seating area. Select Sunshine Orlando Rentals holiday homes are located in a gated community and include a game room. Each home has a washing machine and tumble dryer for added convenience during extended stays. A few of these Kissimmee Sun...shine Orlando Rentals include access to a community clubhouse. Guests will be within 10 miles of the shops and attractions of Old Town amusement park. All homes are within 20 miles of Orlando International Airport and with 15 miles of Universal Studios. Offering an outdoor pool, these Kissimmee holiday homes include a fully equipped kitchen and free WiFi access. Select homes offer a private pool. The ...Walt Disney World Resort is within 15 minutes' drive away. Guests can relax in the screened patio or separate seating area. Select Sunshine Orlando Rentals holiday homes are located in a gated community and include a game room. Each home has a washing machine and tumble dryer for added convenience during extended stays. 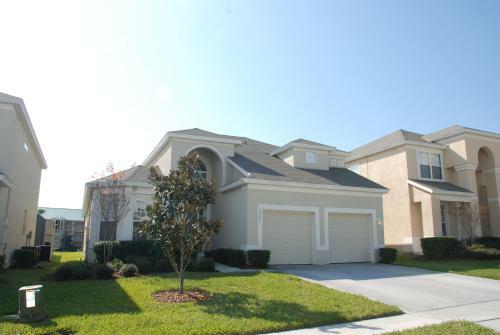 A few of these Kissimmee Sunshine Orlando Rentals include access to a community clubhouse. Guests will be within 10 miles of the shops and attractions of Old Town amusement park. All homes are within 20 miles of Orlando International Airport and with 15 miles of Universal Studios. When would you like to stay at Orlando Vacation Rentals? Guests are required to show a photo identification and credit card upon check-in. Please note that all Special Requests are subject to availability and additional charges may apply. Please note that the service charge is non-refundable. All fees are subject to tax. Please note pool heating is offered for select homes for an additional USD 30.00 per day. Contact property for details. After booking guests will receive a rental agreement via email directly from the property, which must be signed and returned to the property within 72 hours. Please see rental agreement for more details. Property will contact guest with payment instructions after booking. Guests may use the special request box to inform the property of specific amenities they would like, such as hot tub or games room.